As the snow is melting, so did my heart this week when I opened my mail. 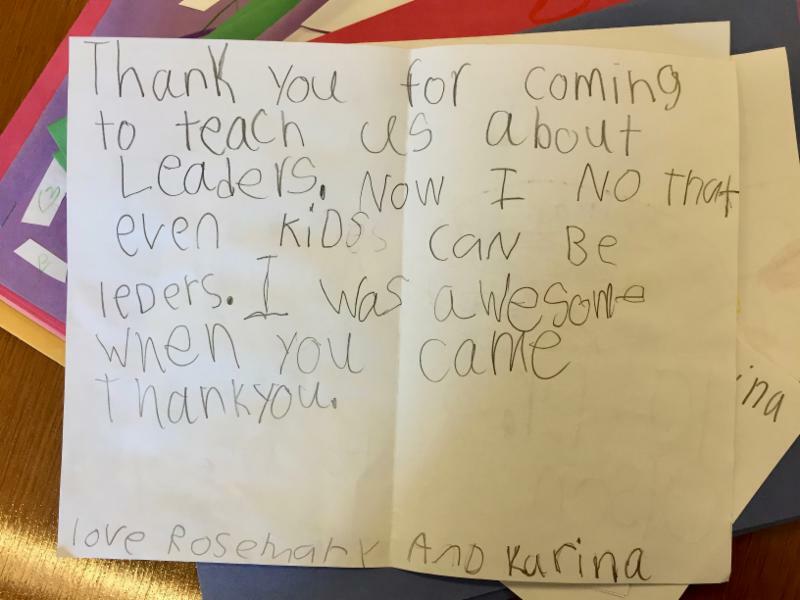 Last week, I shared my experience in talking with our EES first graders about leadership. This week, I received a whole batch of thank you notes. I'm so glad that they remembered my message: Kids can be leaders, too. This time of the school year is always interesting as we are still operating in the current school year but much of my time is spent planning for the next school year. We recognize those programs and initiatives that are continuing to work well in the district and evaluate those that need some adjustments for next year. I always welcome your feedback. Our academic and athletic co-curriculars are at the peak of their season with competitions, and Whitnall is continuing to see many successes. The board will be recognizing all of our fall and winter season accomplishments at the March 26 board meeting. Tonight is the opening night for the WHS musical, The Addams Family. We would like to congratulate Chris Sepersky on accepting a position as an elementary principal in the School District of South Milwaukee, where he served for 14 years. He will start his new position in the 2018-19 school year. We have been fortunate to have Chris start his administrative career at Whitnall Middle School this year as our assistant principal. We wish him well in his new position as a principal. Many of you know that Krystle Stingle joined Whitnall this year as the WHS Dean of Students. During our administrative restructure in January, Krystle graciously agreed to assist us at WMS. On March 26, it will be recommended to the board that Krystle serve as the WMS assistant principal starting in 2018-19. We will be posting for a WMS principal and will solicit feedback from staff and parents in the process of hiring our new principal. Interested in the items being considered at the next board meeting? Check out the board agenda for March 12 on our Agendas & Minutes page . When you get angry, use it as an opportunity to model these appropriate responses for your child and talk about it. Parent teacher conferences will be held on Thursday, March 15 from 4 to 7 PM. The high school's spring musical, The Addams Family, opens tonight! Online ticket sales here (recommended). Cash or check only at the door. ﻿Parent teacher conferences will be held on Tuesday, March 13 from 3:30 to 6:00 PM. Conferences are scheduled for Wednesday, March 14 from 4:00 to 6:00 PM and Friday, March 16 from 12:00 to 4:00 PM. An email was sent by the classroom teachers with instructions for setting up a conference time. If you have questions regarding scheduling, please contact your child’s teacher directly. Also, please note that Friday, March 16 is a half day of school for elementary students. Dismissal will be at 11:20 AM. There will be no K4 classes on Friday, March 16. There is no YMCA care after school on half days. Our photographer will be at EES on Friday, March 23 for spring pictures. Class photos will also be taken. Watch for more information to come home in your child’s folder. Please note that we have installed a reserved parking spot sign for the monthly winner of the PTO silent auction parking spot. This spot is reserved for an entire month, before and after school and for special events. Parents with the winning bid have been notified and the spots are filled for the next several months. Please remember that students in K5 through grade 5 will be dismissed at 11:20 AM on Friday, March 16 due to parent teacher conferences. EC and K4 won’t have school that day. HCE is welcoming the Glencastle Irish Dancers on Friday, March 16 for a performance. Thank you to our PTO for sponsoring the Artist in Residence program that organized this event. Happy St. Patrick’s Day! The 2018 Knowledge-a-thon is right around the corner on March 23. This is an all school fundraising event in which the students are asked to share the knowledge they have learned so far this year. It is a favorite event for the students and a great in-house fundraiser for HCE. Students will be collecting pledges and donations for the event and will have the opportunity to win Target gift cards and be the assistant principal for a day. Detailed information will be coming home tonight.